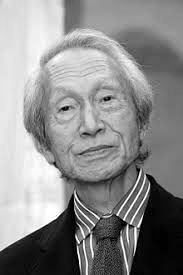 Shoichi Hasegawa (born 1929 in Yaizu - Japan) is a Japanese modernist printmaker. He first studied drawing and painting at the Kokuga Institute in Kyoto. He held his first solo exhibition in Yaizu at age of 28, in 1957. In 1961, he went to France at age 32 to study at Atelier 17 where he worked under Stanley Hayter, and exhibited at the Salon des Jeunes Peintres, Salon des Réalités Nouvelles, International Biennale of Engraving in Ljubljana, and the Biennale of Engraving in Cracow. He has had over seventy solo exhibitions of his work since 1957. In 1972, he won the Young Contemporary Print Artist Award in The Third Culture International Print Exhibition in Tokyo. In 1957, he held an exhibition in Tokyo. He later held exhibitions in Paris, Brussels, Strasbourg, Germany, Tokyo, Kobe and Nagoya. Hasegawa’s art belongs both to abstraction and figuration, and gathers Far-Eastern calligraphy, traditional symbolism of the forms and the colors, and Western new expressions. On colored “tachist” background,the artist etches in white on decorative graphic inspired from the popular Japanese imaginary (ports, stations, scenes of streets etc.) or pure abstract and lyric scenes. Dualism of the orient and occident is expressed symbolically in his art. He became one of the foremost makers of abstract colour etchings. Hasegawa’s work is in the permanent collections of the Bibliothèque nationale, Paris; Museum of Modern Art, New York; Victoria and Albert Museum, London; Lowe Museum, Coral Gables; Oklahoma Art Center; Art Museum of South Texas, Corpus Christi; Norrköpings Museum of Art, Sweden; Museum of Modern Art, Lujbljana; and the Museum Fuji, Tokyo. He lives and works in Vetheuil-Val-d'Oise, France.